I don’t intentionally eat vegetarian but more and more I find myself making dishes without meat. This is more out of laziness than out of any moral persuasion. I always have a bounty of fresh vegetables from the farmers market and my garden. Staples like rice and pasta keep very well in the cupboards so I can buy a bunch of them ahead of time. The same goes for tinned tomatoes. It is hard to keep a variety of meat and seafood on hand with the limited freezer space I share with Roomies #1 and #2 so I usually just forego the meat and cook vegetarian unless I am feeling inspired to go to the store (or if I have been forced to make a pilgrimage to Costco for essentials and have a reason to buy an interesting meat or seafood option). 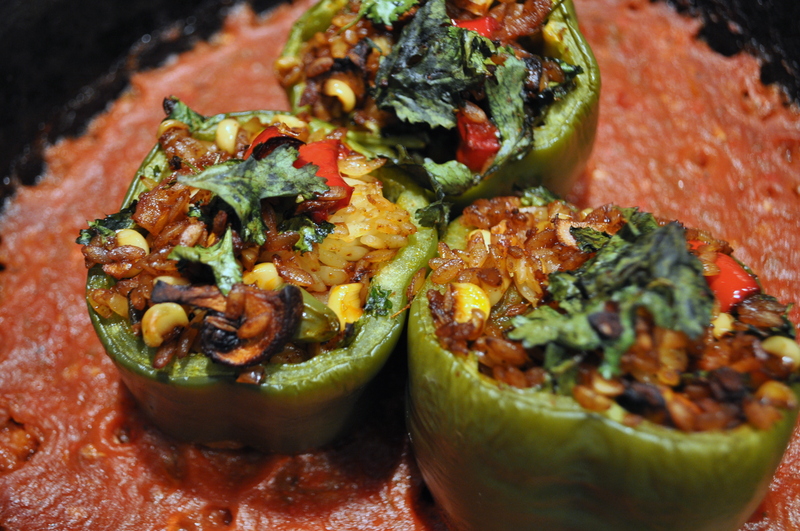 Stuffed peppers are an easy standby dish. They are self contained and already portioned out so they make great leftovers for lunch. This also makes them great for dinner parties. You can stuff a bunch of peppers before the guests arrive and just pop them in the oven right before dinner. You also already know if you will have enough food since eat pepper is a serving (always make some extra though, these are pretty darn tasty and people will be begging for a second helping). They are also incredibly versatile. Leftover veggies become entirely new dishes when you mix them with rice and stuff them inside something. You can add ground meat to the rice or, in this case, orzo (I had some left over that needed to be used up). Just about any seasoning and ingredient combination will be tasty inside a pepper so go wild! No matter what you decide to put inside them, make sure to cook them with a sauce in the pan. This keeps the peppers moist and cooks them more evenly and quickly than without any liquid in the pan. I like to make a spicy pepper and tomato sauce to amp up the pepper flavor in the dish but this is another opportunity for creativity. Thank you! They are so easy and tasty. I would love to know more about the potato stuffing. It sounds interesting and good!